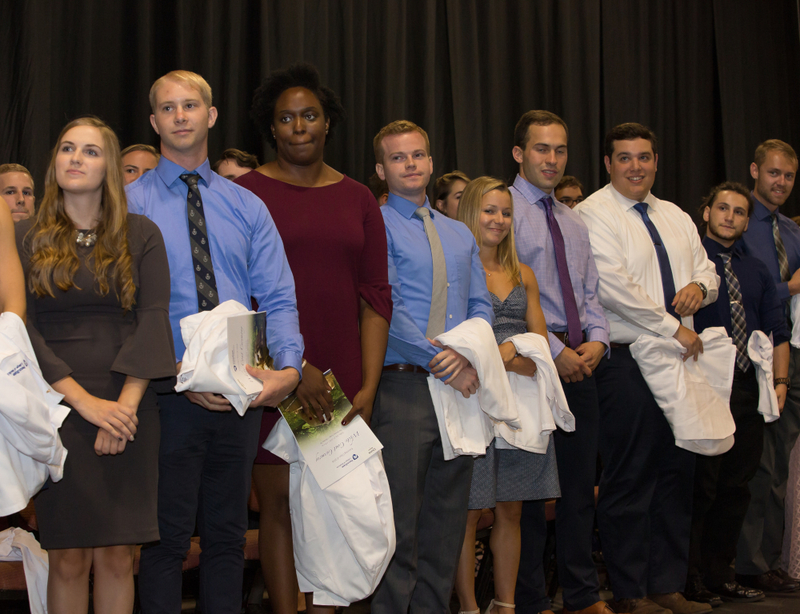 First-year Penn State College of Medicine medical students, including those pursuing their Doctorate of Medicine (MD) and Doctorate of Medicine/Doctorate of Philosophy (MD/PhD) degrees, received their first white medical coats on July 27. This year marked the College’s 23rd White Coat Ceremony. This ceremony for the entering class of 2018 is symbolic for their entrance into the medical profession as student physicians. The incoming class consists of 152 students selected from a pool of more than 10,820 applicants. The class consists of 74 women and 78 men. Sixty (39 percent) of the new students are Pennsylvania residents. The students hail from 92 undergraduate institutions. The students have broad backgrounds with regard to international experiences, work, talents, research and service to communities. For Brittainy Hereford, one of the most moving moments from the White Coat Ceremony began in the days leading up to the event. That’s when Hereford and the other 151 members of the entering class of 2018 gathered to write their Oath of Student Professionalism, a set of 12 vows the student-physicians will embrace throughout their medical school journey. The ceremony continued a longstanding tradition at the College of Medicine. “The ceremony exemplifies our commitment to our medical students and our medical students’ commitment to themselves, to medicine, and ultimately, to the patients they will serve,” said Dr. Dwight Davis, senior associate dean for admissions and student affairs for the college. 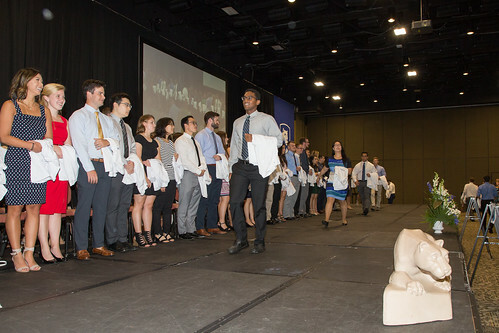 At the ceremony, each of the 152 first-year medical students introduced themselves to the community with their name, hometown and undergraduate college. They then met a faculty member from their society group who helped them don their white coats. Medical students study either in Hershey or University Park, depending on their selection of chosen curriculum. The entering class began its formal study of medicine in pursuit of either a Doctor of Medicine or Doctor of Medicine/Doctor of Philosophy degree on July 30.